Five minutes with a Chicago expert: what's new at Trump and how do they stand apart? Beautifully situated along the Chicago River, Trump International Hotel & Tower Chicago is a five-star property fitting for your most elaborate event or memorable meeting. Elegance lives in details like polished stainless steel and iridescent-tinted glass, while more than 26,000 square feet of function space invites endless creative possibilities. Explore the Grand Ballroom, Skyline Room, Grand Salon, five additional Salons and the Executive Boardroom, featuring videoconferencing capabilities. Call on the hotel&apos;s well-appointed amenities and prime location to impress guests and leave the heavy lifting to the expert staff and highly acclaimed culinary team. Trump Hotel Chicago Director of Weddings and Social Events, Jill Quinn, shares an inside look at the iconic hotel&apos;s meeting and event planner perks. Q. What makes Trump Hotel Chicago stand apart from other nearby meeting venues? A. All of the meeting and event spaces within the hotel feature 12&apos; floor-to-ceiling windows with breathtaking city vistas, including our Grand Ballroom which features 24&apos; floor-to-ceiling windows with panoramic lake and river views. 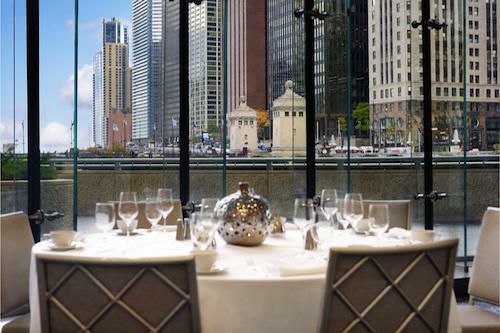 Trump Hotel Chicago recently added three new luxurious event spaces alongside the Chicago Riverwalk, all part of the 26,000 sq. ft. of venue space. Q. Describe Trump Hotel Chicago&apos;s unique catering or meeting services. A. With exception to the newly added space, all of our meeting rooms are located on two floors, providing seamless transition between events. We have a private entrance that is separate from the hotel&apos;s main entrance for extra convenience for guests not staying in the hotel. Q. How can Trump Hotel Chicago&apos;s Event Specialists help execute the perfect event or meeting? A. Our professionals will guide you through the entire planning process, leaving no detail overlooked, offering the skills and expertise needed to make your event a success. Connect with a Conference Planning Specialist, submit an RFP, and start planning your Chicago event. 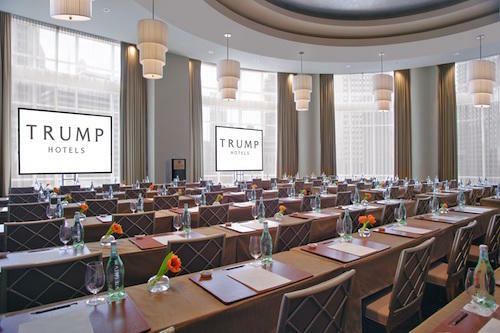 Learn more about Trump Hotel Chicago&apos;s meeting and event space.